​Intraspecific competition is when 2 individuals of the same species compete over a desired resource. Interspecific competition is when 2 individuals of two different species compete over a desired resource. Carrying Capacity – The limit of how many organisms the ecosystem can support. BTU – A BTU it is defined as the amount of heat required to raise the temperature of one pound of water by one degree Fahrenheit. LC50 - The LC50 is the concentration of a toxic chemical that will kill 50% of the organisms exposed to the toxin. Exponential growth occurs when a population is placed in an environment that has lots of space and food and other resources. Exponential growth is when a population grows by a FIXED amount. For example, a growth of 2% per year would be considered exponential. When exponential growth is plotted on a graph (an exponential growth curve) it forms a shape that looks like the letter “J”. Exponential growth will eventually change to logistic growth as the population grows and resources become scarce! When resources are limited, populations exhibit logistic growth. In logistic growth, population expansion decreases as resources become scarce, leveling off when the carrying capacity of the environment is reached. We used a colorimeter to measure the % transmittance of several samples. The control should be set to measure 100% transmittance. This means that there are no cells in the vial, so the light is able to pass right through, thus giving a 100% transmittance. The higher the concentration of cells in the vial, the lower the % transmittance would be! We can calculate the magnification we are observing with the microscope by multiplying the magnification power of the objective, by the magnification power of the eyepieces. Your lab manual refers to the 4X objective as the "scanning objective". You lab manual refers to the 10X objective as the "low-powered​objective." You lab manual refers to the 40X objective as the "high-powered​objective." When transporting the microscope, it is very important to make sure that you have a good grip on the scope and carry it with 2 hands at all times. - One hand should be placed on the base of the scope while the other should be placed on the body (see image). The scopes are not necessarily heavy, but their center of mass is at the base, making it unstable if supporting by one hand alone. Use the COARSE FOCUS knob to move the stage all the way toward the bottom (base) of the scope (if it is not already there). Locate the 4X objective and make sure that that objective is pointing directly down toward the stage. place slide on the STAGE, securing it under the two metal clips. Locate the STAGE ADJUSTMENT knob and notice that this allows you to move the stage right and left and forward and back. Now with the stage all the way at the bottom and the 4X objective pointed at the slide, use both eyes to view the slide. While you continue viewing the slide through the eyepieces, use the COARSE FOCUS knob to slowly move the stage upward (toward the objective) until the slide comes into view. Only after performing all of the steps (1-14) first and in order, do you want to proceed with the instructions here. Once you have your object fully focused at 4X, make sure the object is directly in the center of our point of view. YOU WILL NOT USE THE COARSE FOCUS KNOB WITH ANY OBJECTIVE OTHER THAN THE 4X! The NOSE PIECE is used to rotate the objectives into position. 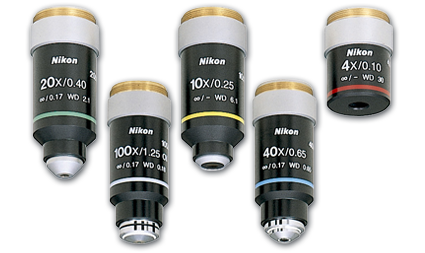 When using the any objective other than the 4X, You may use the STAGE ADJUSTMENT knobs and the FINE FOCUS knobs only (NOT THE COARSE FOCUS) to center and focus the object at this new magnification. 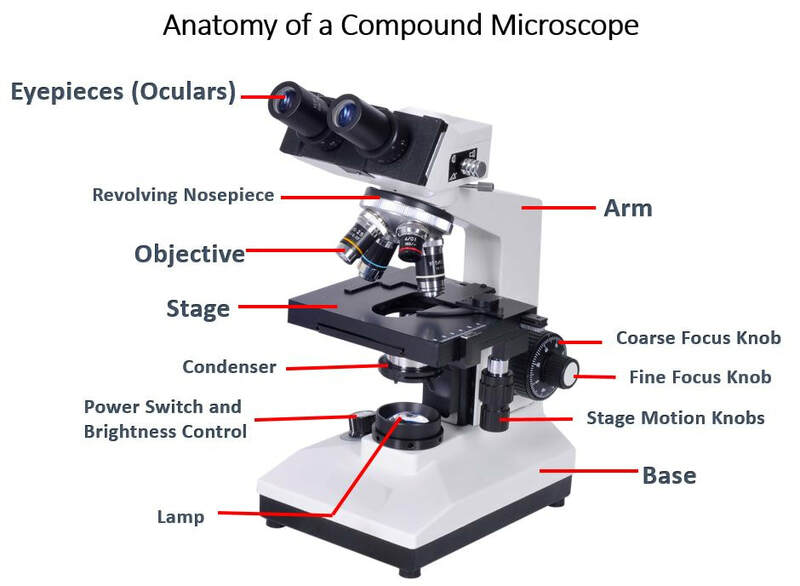 --- Microscopes have a special property, called "being PARFOCAL" which means that once the object is focus and centered using the 4X, when you switch to the next highest objective, your specimen will be relatively centered and in focus. You should only have to make MINOR adjustments to the FINE FOCUS and the STAGE POSITION, in order to view your object at the higher objective. If you have difficulty, you must go back to 4X and recenter and refocus! The field of view DECREASES as you INCREASE magnification. The amount of light observed through the microscope gets dimmer (is reduced) as you increase magnification. You should notice that the image you see is UP-SIDE-DOWN and REVERSED (the is INVERSION). Images seen through the compound microscope are flipped upside-down and are reversed! Stomata are cellular pores on the surface of plant leaves (mostly on the underside of the leaf). STOMATA OPEN TO... They open to allow the uptake of carbon dioxide, the release of oxygen and allow water evaporation from the plant to occur. STOMATA CLOSE TO... They close to limit water loss. The epidermis consists of the upper and lower epidermis; it aids in the regulation of gas exchange via stomata. The epidermis secretes a waxy substance that lays on top of the leaf and is known as the cuticle. 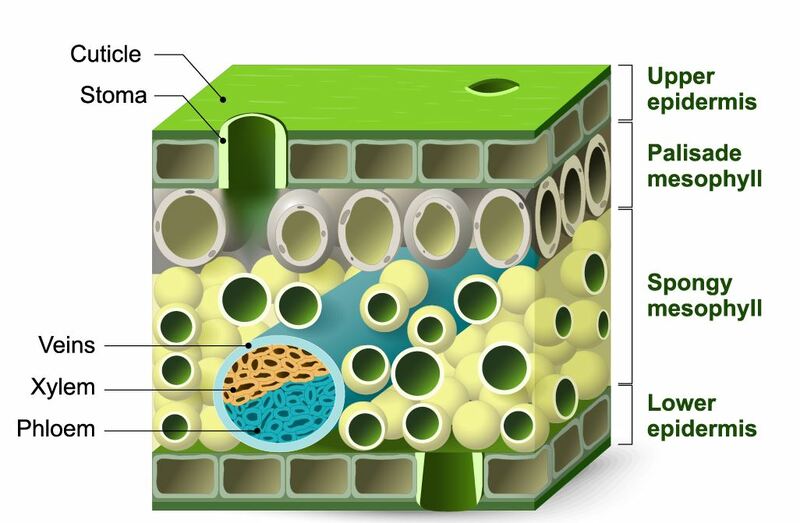 Palisade cells are plant cells located right below the upper epidermis and cuticle. THIS IS WHERE PHOTOSYNTHESIS TAKES PLACE! The spongy mesophyll cell layer is beneath the pallisades. Plant adaptations for Dry Conditions. 1) thick and waxy leaves. This adaptation helps to reduce the amount of water lost from the leaves. LC 50 is the concentration of a toxic substance that kills 50% of a population. LC stands for "lethal concentration". The LC50 value is determined by a bioassay. In the bioassay, several vials containing the exact same concetration of cells will be exposed to various concentrations of the toxin. After a period of time, a colorimeter will be used to determine the % mortality and the % of surviving cells by comparing the results to a control vial containing cells that were NOT exposed to the toxin. Toxic chemicals are transferred from one organism to another through the food chain. - An example of conduction would be when you put a hot object on a cold object, the heat will be transferred from the hot object to the cold object. 2) convection - Convective heat transfer, often referred to simply as convection, is the transfer of heat from one place to another by the movement of fluids. 3) radiation - Heat is transferred from a source of waves carrying heat to another substance that will allow the radiation (like sun rays) to pass through.